Further Honour for Krakow Saint? A nun from Krakow is in line to become the first Pole to receive one of the highest honours of the Roman Catholic Church. 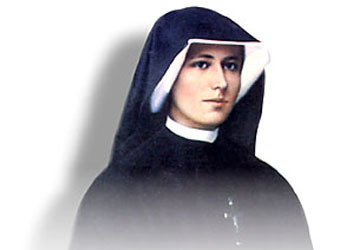 The organisers of the World Congress of Divine Mercy, to be held at the beginning of October, have put forward Sister Maria Faustina for consideration as a Doctor of the Church. The honour would place her among an elite of just 33 saints. In her lifetime Sister Faustina claimed to have had visions of Christ and even to have conversed with him. She recorded in her diary that, during one such conversation, Christ told her to paint a picture of him and that the image should be blessed on the first Sunday after each Easter. Although she painted the original picture in a convent in Vilnius (now Lithuania) it has inspired many other artists since then. Other entries in her diary include notes from her mystic encounters, and several predictions – including one that seemed to forecast the coming of World War II. Sister Faustina, born Helenka Kowalska in 1905, traveled widely in Poland and served at several convents. She spent her last days in Krakow, died on October 5 1938, and is buried at the Sanctuary of Divine Mercy at Łagiewniki. Nowadays this is a place of pilgrimage. Przemysław Bednarz, spokesman for the Sanctuary of Divine Mercy, said Sister Faustina’s acceptance as Doctor of the Church would be a huge event for Catholics in Poland. The Vatican will review the application and the Pope will make the final decision.